His music was far beyond contemporary music, which is merely the clashing of cymbals, drums and other instruments to produce some rhythm and melody. Michael‘s, was more of the combination of the soul searching rhythm with deep rooted meaning attached to every word he uttered. With 754 million copies of various albums sold to his credit, and gathering the largest ever number of participation in a musical concert, Michael Jackson was certainly phenomenal. His music was the work of reflection; brainstorming and it touched the hearts of men, women, the good, the bad and the ugly as well as, politicians, civilians and military men. He revolutionalised video clips and gave a new meaning to music. Michael Jackson was a man whose music was greatly loved by people cut across all races, cultures and countries but again, who was also detested by a few cut across all races and cultures too. Without delving into the negations, Michael was deeply admired by music lovers but regarded as a betrayal by his fellow Africans, some of whom considered him as man who hated his own colour and whose repeated plastic surgery, finally got rid of him. Michael did not die of skin cancer; he died of a heart attack as the family spoke man and elder brother Jermaine Jackson announced. However, some argue that if Michael had not changed his colour, he might not have had the successes he enjoyed. Despite the change, horrible and cooked up charges were brought against him to ruined him at all cost. Some argue that his detractors actually succeeded because, inasmuch as Michael enjoyed the highest glory that have ever been enjoyed by any human on the planet earth, he also witnessed the worst moments which have ever been witnessed by any star. The several lawsuits, divorces and blackmail, which though common with artists, were kind of exaggerated for Michael Jackson. Nevertheless, the lesson to learn from Michael is that his music brought people together irrespective of race, culture or religion. People celebrated and worked together with Michael. 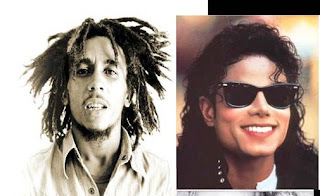 As far as music of all genres is concerned, Michael Jackson and Robert Nesta Marley aka Bob Marley remain the best artists who have ever lived. The shoes of these two great music icons will hardly ever be worn by any artist of this generation and beyond. Michael with his best voice ever died at 50, while Bob Marley died at 36. At these ages, only Jesus Christ who reportedly died at 33, has moved the world so much but it acceptance may not be unanimous given that Jesus is limited to Christians. Michael’s legacy remains his formidable dancing skills, his lyrics and his personality. He was and an incredible and an extraordinary entertainer. All these certainly overcome the controversies and the turmoil Michael either forced himself into or was forced into by his detractors. Michael and Bob have died but they will never die. Before Michael died, he had converted to Islam. All these, because of the certainly harsh political and witch-hunting Christian west tradition on people of his descent as has been with other artists, sportsmen, activists etc. However, Michael still had huge fans from the very Christians West who gave him unflinching support still.